Two hours. After some fierce negotiations, that's how long our taxi driver had agreed to wait for us while we visited the Sheikh Zahed Grand Mosque. 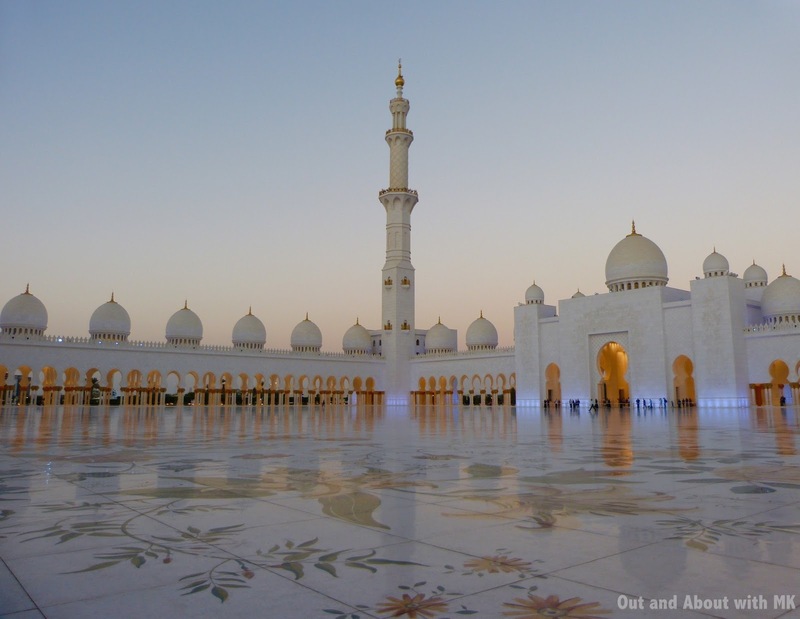 The driver had quickly countered our original request for a one-way trip to the mosque by proposing a six-hour tour of Abu Dhabi. We would, he promised, see all the main sights. 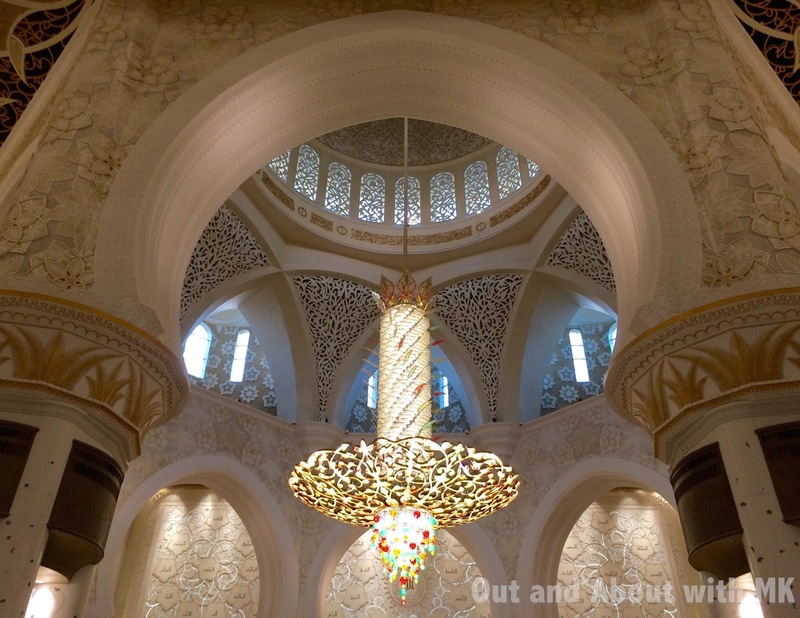 In the end, we settled somewhere in the middle thinking that two hours would give us plenty of time to visit the United Arab Emirate's (UAE) largest mosque and make it back to the cruise ship for dinner. If I would have known that the Grand Mosque would turn out to be one of the most photogenic buildings I've ever encountered, I would have bargained for more time. The setting sun was already casting a golden glow when the taxi driver dropped us at the back of the mosque. Mesmerized by the light and long shadows, I quickly pulled my camera out of my bag and ran from one spot to another shooting photos of the mosque's 82 domes and four minarets. When we stopped at the guard booth to ask for directions to the main entrance, the guard offered each of us a bottle of cold water. More than anything, this gesture affirmed Sheikh Zayed's intent that the mosque bearing his name should be a place for Muslims and non-Muslims alike. After circling the complex, which is approximately the size of five football fields, I gasped when I first caught sight of the curved arches of the gallery casting shimmering reflections on the pools surrounding the mosque. Regrettably, I lost about 15 minutes of prime photo taking time because I had forgotten to bring a headscarf and had to walk (although I really wanted to run) to an office in the underground parking garage to borrow a head covering. Since my white linen pants were somewhat transparent, I was asked to don a long blue gown with a hood. 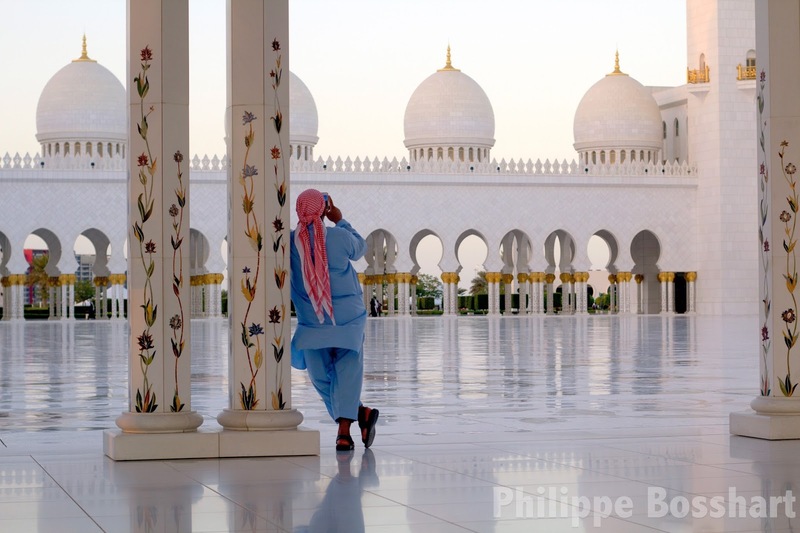 With my hair and body completely covered, Stéphane almost didn't recognize me when I rejoined him at the mosque's entrance. Slipping off our sandals and placing them in one of the wooden compartments, we padded on silent feet into the foyer. A colossal chandelier hanging from its domed roof was a prelude to the grandeur of the main prayer room, which can accommodate up to 10,000 worshippers. Designed in the shape of an eight-pointed star, the floor of the expansive room is covered with the world's largest hand-knotted carpet. Its intricate Islamic medallion design was crafted over a period of 12 months by 1,200 artisans. Seven crystal chandeliers produced in Germany hang from the ceilings of the foyers and main prayer room. The biggest, which weighs 12 tons, is reputed to be one of the largest chandeliers in the world. Encrusted with thousands of Swarovski crystals, the result is dazzling. As we exited the main prayer room, the evening call to prayer began to reverberate off the marble columns. Even though I'm not Muslim, the sound made the hairs on my arms stand on end and brought tears to my eyes. It reminded me of the years we lived in Indonesia when the call to prayer was an integral part of our days. While I was never a fan of the first call to prayer emanating from the neighborhood mosque shortly before sunrise, the evening call to prayer was always a moment to pause and appreciate the soft hues of twilight. The courtyard of the Sheikh Zayed Grand Mosque in Abu Dhabi can accommodate 30,000 worshippers. 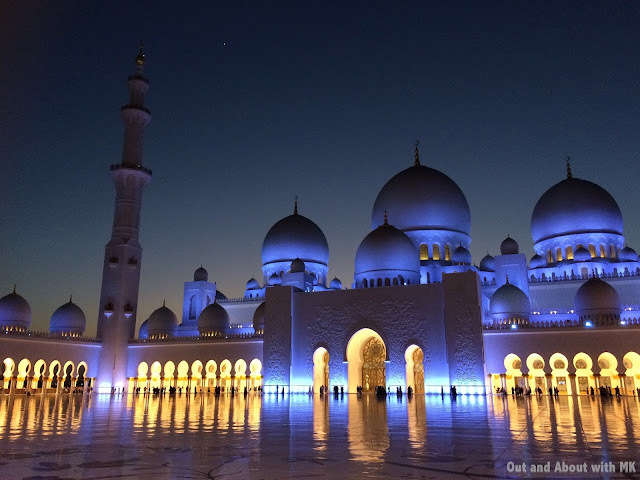 Due to its unique lighting system designed to emulate the phases of the moon, the mosque's facade and domes take on a slightly different color every night. When the moon is a small crescent, the mosque's lighting is a dark shade of blue replicating the color of the sky. During the full moon, the electronic control system reacts to the intensity of the moonlight and casts gleaming white lights on the mosque. The lighting design, which was the first of its kind in the world, ensures that the mosque is always in total harmony with its surroundings. The Sheikh Zayed Mosque welcomes visitors from Saturday to Thursday (9am to 10pm). The mosque is closed for worship on Friday mornings but reopens for visitors after 4:30pm. Complimentary guided tours are offered in English and Arabic. To plan your visit, please check the official website. Special thanks go to my son, Philippe Bosshart, for allowing me to include some of his pictures in this post. It was fun watching the enthusiasm with which he photographed this inspirational building. The results are impressive. The unique lighting system of the Sheikh Zayed Grand Mosque in Abu Dhabi emulates the phases of the moon. 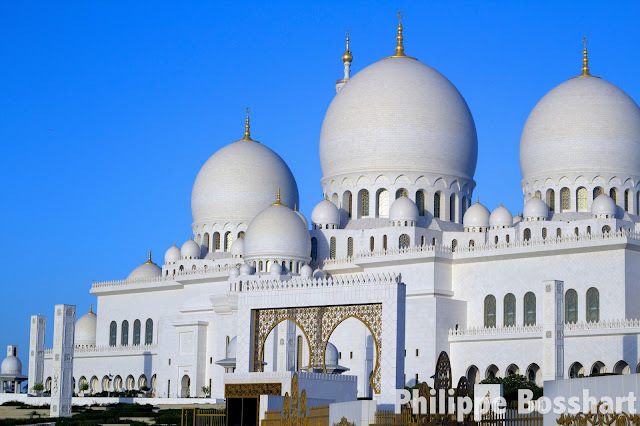 It's amazing how Muslim monuments are some of the most photogenic in the world! You need only take the Taj Mahal as an example. The photos are stunning. I particularly like the two by Philippe with people in them. I have a tendency to use photos with no one but these ones tell a wonderful story. Thanks to both of you for a wonderful visit. I loved seeing your photos of the Taj Mahal, Rosemary! One of these days I hope to see it in person. Our cruise ship offered it as a very expensive group excursion but I'd rather visit it on my own. 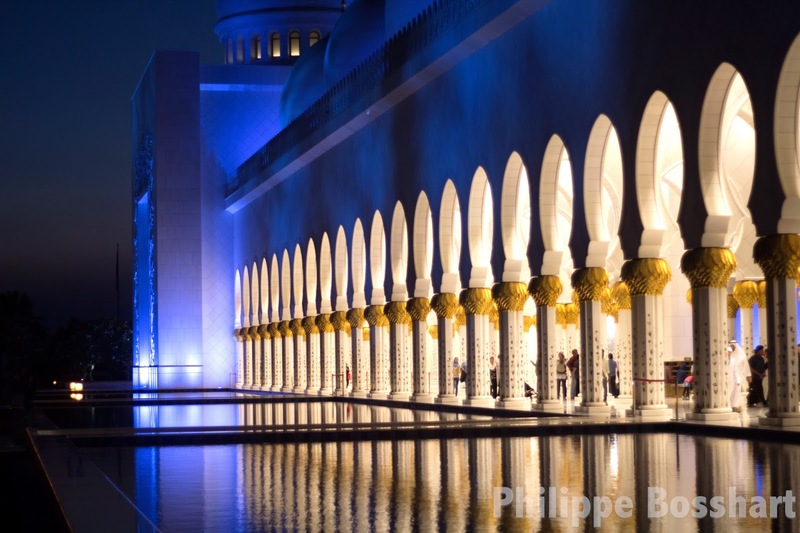 Thanks for your comment about Philippe's photos. I'll pass it on to him!